From the Star Wars collection by Vandor. Star Wars Return of the Jedi Large Lunchbox Tin Tote. This Item is in stock and ready to ship. You should not postpone your purchase and miss out on adding Star Wars Return of the Jedi Large Lunchbox Tin Tote to your Star Wars collection! From the Star Wars collection by Vandor. 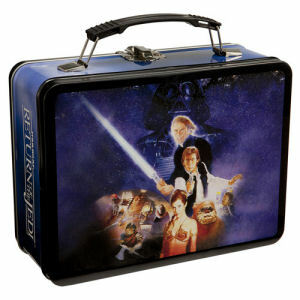 Star Wars Return of the Jedi Large Lunchbox Tin Tote. The large tin tote is great for storing and toting supplies, music and gear. Collapsible plastic handle and metal latch closure. Measures 9 x 3.5 x 7.5 Inches. Vandor Star Wars Totes shipping from Canada. No Surprise Border fees or Customs!